When Martin Cooper made the first call using a mobile phone in 1973, little did he know that the same device would someday be used for shopping. Over the years, technology has taken a new shape and has enabled functions that were once unimaginable. One of which is mobile eCommerce. With the advent of eCommerce, the traditional brick-and-mortar retail outlets faced the heat as customers preferred the convenience of shopping online from their home. 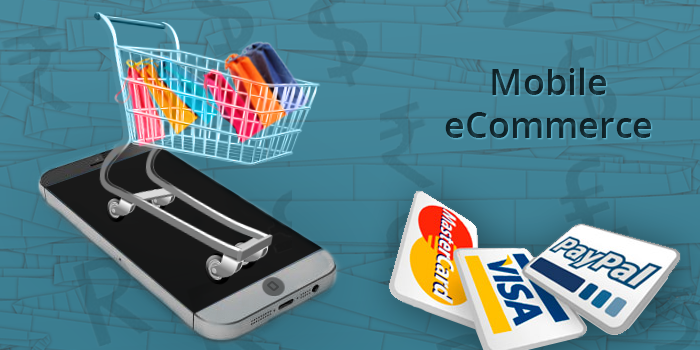 With increasing penetration of smartphones, mobile eCommerce has become a global crowd-puller now. Mobile eCommerce is now giving web-based eCommerce a run for its money as it has taken customer convenience few notches higher. People of all age groups find it much easier to explore and buy goods online through their wireless electronic devices such as mobile phones, tablets and laptops as they can be carried anytime anywhere. According to reports, around 100,000 eCommerce stores which use the Shopify platform witnessed 50.3% of traffic coming from mobile devices while only 49.7% came from websites. These ratings stand testimony to the fact that shoppers are increasingly preferring shopping on their mobiles or tablets. How can technology help retailers tap the mobile eCommerce market? In the fast-paced digital age where customers have instant access to product information, pricing, offers, etc. and do not hesitate from undertaking transactions on the internet, retailers have to adopt innovative IT solutions to cater to their customers. As smartphones are getting more consumer-friendly with every passing day,the challenge here arises for retailers to make the most of this trend. The first step towards this is developing a mobile responsive website which is optimized for viewing on all wireless handheld devices. Mobile apps for eCommerce are fast emerging as useful aids to eCommerce websites to take the store to customers’ fingertips. It is critical to smartly emulate the desktop effect on the smartphone so that customers get a delightful user experience despite the limited screen size. Long product descriptions, small links and asking customers to fill large forms are a strict no-no. A streamlined purchase process with just a couple of steps to check-out and close a transaction will substantially reduce turn-around time and enhance customers’ online shopping experience. Gone are the days when internet speed constrained users from extensive browsing – customers now have zero tolerance for loading bars and pages which are down altogether. Low latency and high availability have become hygiene factors in mobile eCommerce. It has been observed that customers often indulge in virtual window-shopping through mobiles but shy away from making actual purchases on mobile platforms. They use mobiles just to explore, browse and compare products, prices and promotional offers on-the-go. To minimize instances of abandoned shopping carts and convert window-shoppers into buyers, merchants today need to work upon delivering a variety of features to their online customers. Features like saving favorite items in the shopping carts for future purchase and prompting recently searched products as a reminder for purchase are adopted my many eCommerce sites today. Mobile apps allow merchants to send push notifications to users on new products and offers, enticing them to make a purchase. Data analytics is a powerful tool that can enable merchants to analyze customer shopping patterns and tailor their offerings for customers. For instance, merchants can offer discounts on specific products of interest to customers or devise bundled products of complementary items based on past purchase information. ‘People who bought this also bought this’ kind of suggestions on eCommerce sites are designed to keep the customers hooked to shopping on your site.